Located in Clearwater, Florida, we are a Zen Buddhist sangha founded in the 1980's by Ken Rosen. Our teacher, Roshi Lawson Sachter studied Zen Buddhism for many years under Roshi Philip Kapleau at the Rochester Zen Center. He and his wife Sunya Kjolhede, both Dharma heirs of Roshi Kapleau, co-direct Windhorse Zen Community, located near Asheville, North Carolina. Lawson visits and conducts retreats at the Center in Clearwater several times a year. The practice of our sangha follows the traditions and teachings of Roshi Philip Kapleau (1912-2004), whose book The Three Pillars of Zen was instrumental in introducing Zen Buddhism to the West. Parking for Clear Water Zen Center: Please park in the unpaved parking spots marked by yellow parking curbs in front of the Clear Water Zen Center. The paved parking lot is reserved for the Unitarian Universalist Church and often is filled to capacity on Sunday morning and Wednesday evening. 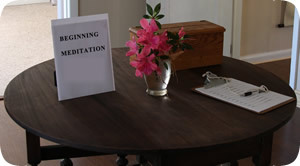 When arriving at the zendo for the first time, let us know that it is your first visit and we will show you around and explain the simple routines that are followed. For example, we take off our shoes before entering the building and there is no assigned seating except for the monitor's and timer's places which are marked with bells and wooden clappers. We sit facing a wall. Favorite meditation cushions can be brought from home if desired but it is not necessary to bring anything; the zendo is fully equipped with cushions, benches, and chairs. Use the cushion, bench, or chair of your choice. We start on time, promptly at 9:30 AM on Sunday morning, see the schedule for more details. The Han, a wooden percussion instrument, is played, signaling that it is time to find a place to sit. Next three rings of a small bell is heard, signaling that it is time to seat yourself and get comfortable for the coming round of meditation. After the third ring, we hold our posture (as best we can) without moving for the next 35 minutes. It is acceptable to move a bit; just do your best. Zen masters say: When the body is moving, the mind is moving. After 35 minutes, the small bell rings again and everyone stands up and faces outward, away from the wall, on the floor in front of the cushion, bench, or mat. At the second ring of the bell and we perform a simple bow to one another. On the third ring we begin a clockwise walk around the zendo. This is kinhin, or walking mediation. Simply turn to the left and follow the person in front of you. We walk in single file for five or six minutes, after which the bell rings again. Continue walking until you get back to your place and face outward. When everyone has arrived at their place, the bell rings again and everyone is seated. The cycle then repeats itself. We sit for three rounds of meditation of 35 minutes each. The second round may sometimes be replaced in whole or in part with a live or recorded dharma talk, or by a chanting session. We recommend that you attend a number of Sunday sittings before attending an intensive meditation retreat (sesshin). We welcome any comments or questions that you may have! Feel free to email us at or call us at (727) 537-0869. 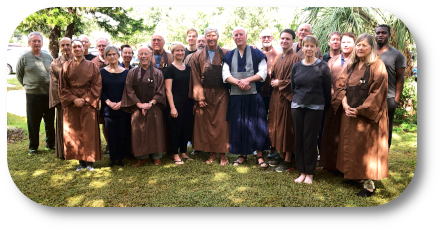 We look forward to seeing you at the Clear Water Zen Center! The Clear Water Zen Center is a 501(c)(3) non-profit organization. Donations may be tax deductible, please consult your tax advisor. We are not affiliated with any other political or religious organizations.